It's super crazy over here, I've got a week left of classes and about 10 big assignments due within that time so I'm tired and feeling stretched for time. I am super excited today though because I am participating in the December swag swap hosted by Keyona at skinny and delicious! (Hoping to link this later) the theme is Christmas and you get to fill a box for a fellow blogger assigned to you and do a secret Santa swap! I LOVE finding new bloggers and can't wait to get to know some of them from this awesome exchange! If your new to the blogging world like me this is a great way to branch out! Along with this Christmas theme, my boring/ simple decorations are up! I posted a picture of my tree but don't have much more besides that. We live in a small apartment but the location is worth the lack of space plus we don't want to commit to a house. 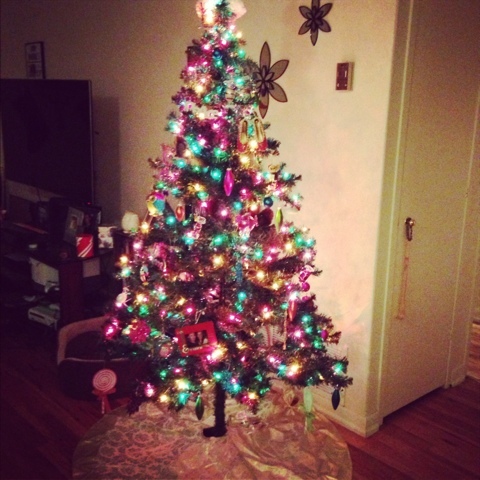 I love my simple tree it makes the place homey! 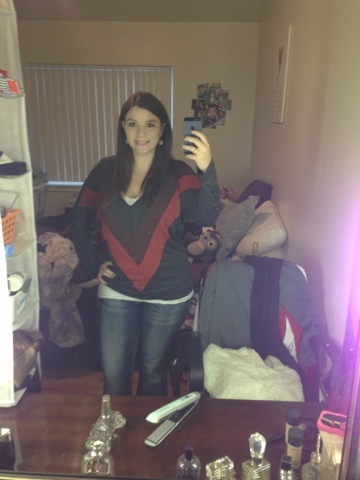 The awesome top I ordered from shop Kiki la'rue came in this weekend! It is so comfy! It's called the mama Laughlin top and it has a super cute cutout in the back. I love tops that have fun backs on them. Pictures below! In other news, I went shopping yesterday before work and got an amazing owl sweater! I am OBSESSED with cute owl stuff! Pictures coming soon! I apologize for the lack of photos but I will get on it soon along with hopefully a new layout. Yay! How is your week going? What are you looking forward to? 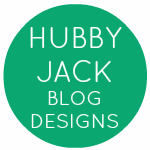 Hi, I was on Hubby Jack's blog (He's fricking hilarious) and saw he did some design work for you so I just swung on by to check you out. 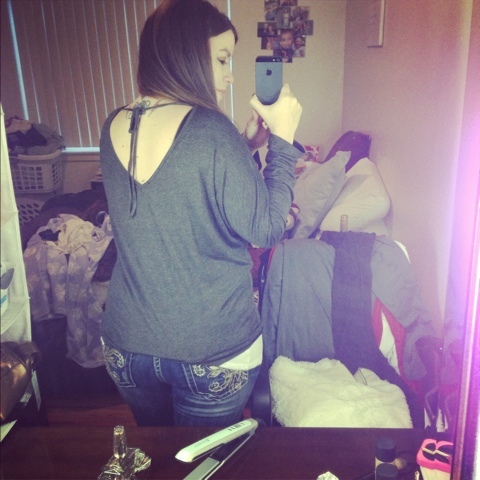 I love Mama Laughlin's blog plus I think that shirt looks awesome on you, very flattering! Now I want one! OMG his post yesterday was hilarious, like one of the best things I have seen all week. Plus I am in love with my layout and totally an idiot when it comes to that stuff. Thanks! You should follow @kikilarue on facebook/instagram they do a lot of discounts, which is why I ended up buying the shirt during black friday week and they always restock popular products plus the shirt fits a little big so you can size down which always feels good. Thanks for reading the blog! I am new to this so I'm glad you like it!